Home > June 2016 > Financial Advisor Awards : FundsIndia have been declared the best in investment advice, 3 years in a row! 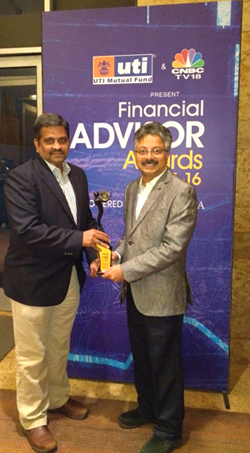 Financial Advisor Awards : FundsIndia have been declared the best in investment advice, 3 years in a row! the best in investment advice, 3 years in a row! Chennai based FundsIndia.com has never just been an online store for investment products. FundsIndia have strived to be of a lot more value in the lives of their customers by gifting them something invaluable – the gift of prudent and unbiased investment advice. It makes us very happy to announce that for the third year in a row, we’ve bagged the ‘CNBC-TV18 – UTI National Online Advisory Service Award’ at the Financial Advisor Awards that were held in Mumbai last night. FundsIndia won the award this year for their high volume of quality investment advice that was disseminated between 2015 & 2016. The jury for the award constituted renowned financial experts from different organisations. Winners were picked after a thorough analysis of advisory data, and a presentation from each of the nominees.